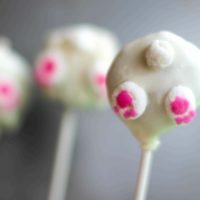 I’ve never made cake pops before, but after I saw this blog post on Rose Bakes, I knew I had an activity for Easter. They were just too funny not to try. I will say that cake pops are not for the faint of heart. After melting a ton of white chocolate, crumbling a ton of cake into the chocolate, and starting multiple times, I got a few that were picture worthy. Note how I purposely blurred that background. ? I figured it would be ridiculous to not use carrot cake for a bunny cake pop. 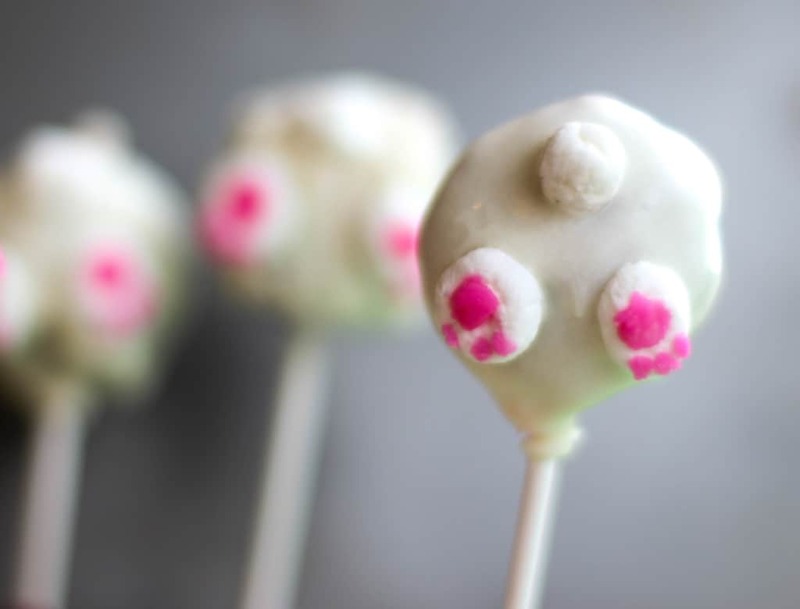 I used some cream cheese frosting to hold them together, but you can literally use any combination for cake pops. I made one box of carrot cake mix, but only tried to make cake pops out of half of the batch. I used about half the tub of cream cheese frosting and rolled them into about 1″ balls and plopped them on some parchment paper. I learned quickly that you definitely want to chill these bad boys for them to cooperate. I would take a few out from a freezer at a time to make sure that they didn’t warm up too much while waiting. Somehow this was my first cake pop I made and I think the most successful. I just heated up about half a bag of white chocolate chips in a mason jar on 30 second intervals until it was liquid. I put in the stick and dunked the cake pop in the mason jar. It took a few twirls of the stick to get it all covered and get the excess off. I luckily had some 2″ craft foam that I poked some holes in that I used to hold up the pops while I moved on to the next. And those feet and tails? Mini marshmallows. I took one and just rolled it up for the tail. For the feet, I squished the marshmallow from the two ends to give me more of the oval look. Using pink icing and a small tip, I piped on the bigger circle and used a toothpick to put on the smaller pads. I had a set of these ready for when I dipped the pops into the chocolate and just put them on when the chocolate was still wet. After all this, my biggest piece of advice is to be patient. It is definitely frustrating if you haven’t done it before, but once you get the hang of it, it’s totally worth it for those adorable bunny bums. ?? A fun dessert to share for Easter! Make cake mix in 9x13" according to the box and cool completely. Crumble cake in a large box until fine. Add all the frosting to the cake until well combined. 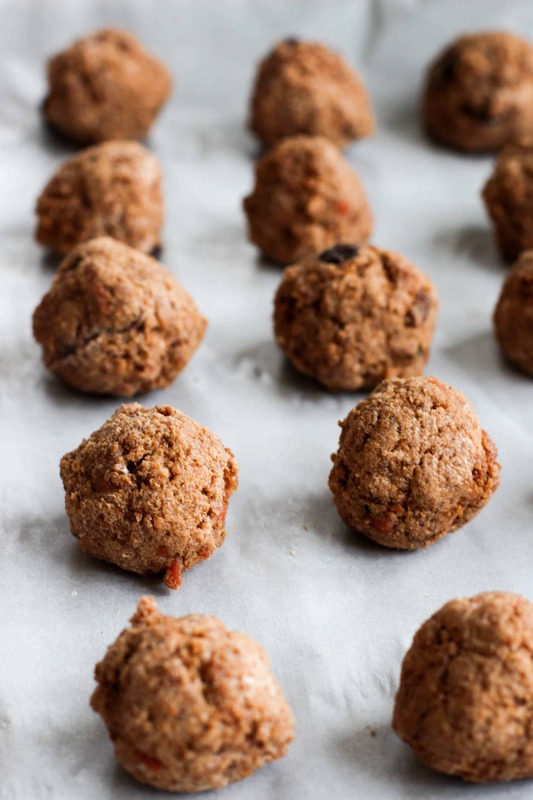 Roll into 1" balls and place on a parchment lined cookie sheet. Place in freezer for 15 minutes. While cake is baking or pops are in the freezer, roll 1 marshmallow for a tail and squish two from end to end to create feet. Use pink icing to create the pads on the bottom of the feet. You may need to use a toothpick to create the smaller pads. You'll need one set of the three per pop. 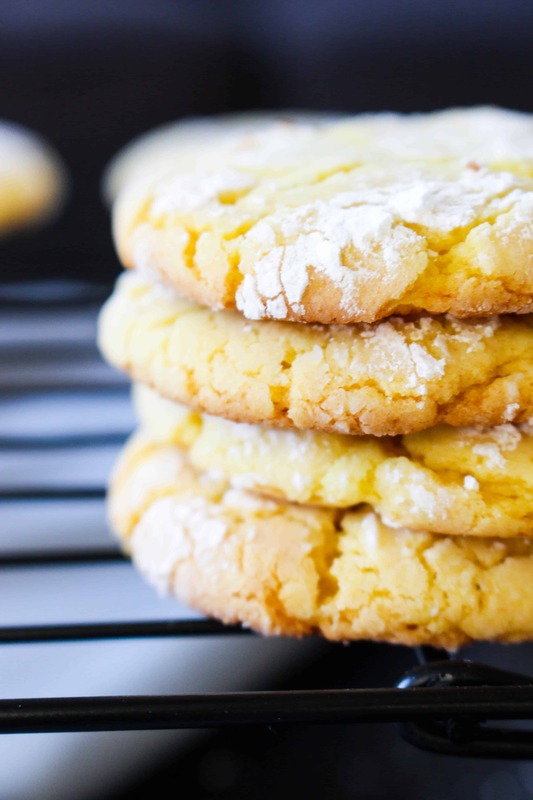 While pops are in the freezer, melt 6 oz white chocolate in microwave in 30 second intervals and mix in between until melted, or use double broiler. Take a few cake pops out at a time. 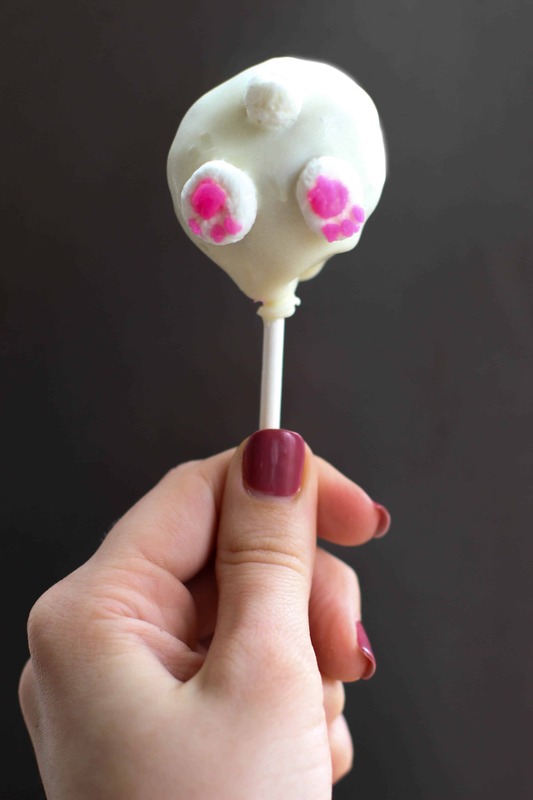 Put a stick into the cake pop and roll around into the melted white chocolate. Hold over the chocolate to let drip off of the extra. Stick tail and feet on the chocolate while still liquid. Place in a foam or styrofoam block to hold up cake pops while drying.